Fair warning: I’m not completely unbiased with this movie. Like many people, I absolutely love Queen and I think Freddie Mercury is the best showman to ever walk the Earth. When I first heard about the Bohemian Rhapsody movie, I was really excited about it and that increased after seeing a brilliant trailer. However, it’s safe to say that the reception to the movie has been mixed. A lot of critics have problems with it but personally speaking, I don’t agree with them on this one. The story of Bohemian Rhapsody is about Queen’s origins and their rise to fame while dealing with dramas and obstacles on the way that eventually lead to a climax with one of the best rock performances of all time at Live Aid 85. From what I can tell, the disappointments that critics have had come from the movie not being what they expected. 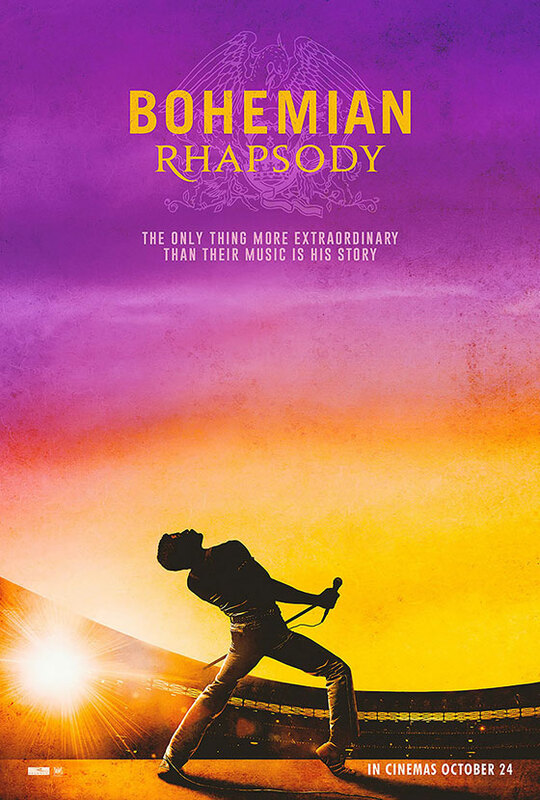 To cut straight to the chase, if you’re expecting this movie to explore the darker side of Freddie Mercury’s life then you’re not going to find it here because this is a movie that celebrates Queen and its legendary frontman. This may be a problem because while things like Freddie’s extreme partying ways are touched upon, they aren’t showcased in graphic detail but I don’t have a problem with it. For me, it’s not the first thing that is thought about when it comes to Queen. It’s about what this band has become and why Freddie Mercury is an inspiration and beloved by so many to this day and that’s captured in spades. Every review has said it but if there is one reason to see this movie then it is for Rami Malek’s (of Mr. Robot fame) brilliant portrayal of Freddie Mercury. It is the polar opposite of the troubled characters he’s played before but within minutes, he quickly put any scepticism to rest. This is probably the best performance of his life. Rami Malek owns this larger than life role. The amount of work and commitment he put in really paid off from getting a movement coach, the amazing costumes and prosthetics. I genuinely didn’t see Rami Malek on the screen. If I didn’t know any better, I’d think it was Freddie. It was a risk on his part as this is something that could’ve gone horribly wrong but Malek captures Freddie in all his complexities, charisma and with a lot of heart. There has been a lot of buzz that he might get nominated for the Oscar for this performance. If that does happen then it’ll be truly deserved. There is a lot of great competition this year but he would legitimately have a shot of winning. If nothing else, I sincerely hope he gets more recognition after this movie because while he is pretty successful already, I hope his career continues to grow even more. Rami Malek is the strongest performer in the movie but his co-stars are just as impressive. Lucy Boynton is another highlight as while Malek is the star of the show, she is right alongside him as the emotional core as Mercury’s former fiancée, Mary. Allen Leech does a great job as what could be considered the antagonist of the movie, Paul Prenter. Ben Hardy, Joseph Mazzello and Gwilym Lee are also great as the other members of Queen. Special notice to Gwilym who basically becomes Brian May in this movie. Since this controversy has been brought up time and time again, I feel like I should address it. There were accusations of straight-washing Freddie Mercury. I’m going to be blunt but I rolled my eyes at this one. I completely understand the importance of LGBT representation and I always welcome it. However, this accusation was made from the two-minute trailer rather than the full-length movie and I had a feeling it’d be in the movie. I was right. Freddie’s sexuality and his attraction to men is addressed in the movie and shown quite often. Admittedly, it’s tamed down much like the party scenes are because of the rating but it is there. Last but definitely not least is the music. It is mostly Freddie Mercury’s voice with Malek’s and another singer called Marc Martel mixed in there. It’s not distracting at all as it does look like Malek is the one actually singing those songs. It’s one of those movies where I envy anyone who sees it in IMAX as the Live Aid performance is replicated perfectly and is the best sequence of the film by far so I imagine it would be even better in IMAX. Overall, it’s understandable why critics have had problems with this movie because it doesn’t dive too deep into things but I think the critics have been way too harsh with it. Bohemian Rhapsody humanises a man who is widely considered a legend and explores how loneliness can affect anybody regardless of how incredible their lifestyle may look. Yes, it doesn’t do everything with great development but it’s still an entertaining and interesting ride. I walked out loving Queen and Freddie Mercury more than I did before while also being on the verge of tears and that was what the movie intended. Bohemian Rhapsody has one of the best performances of the year in Rami Malek and if you’re a Queen fan, you will find something to love in this movie. It showcases why this band has captured the hearts of many through the generations and I can’t wait to see it and be inspired by it all over again.